I did have some success this week at finding new wax. It looks like my Walmart is finally getting in some of the spring/summer scents. Thank goodness! I think you can tell from my wax selection this week that I'm over fall/winter scents for sure. 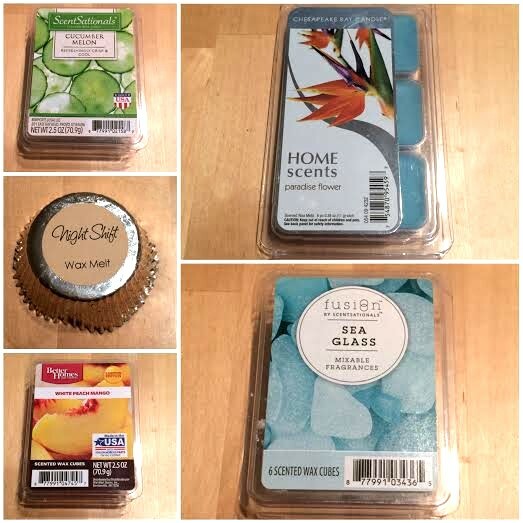 I'm enjoying the colder weather, but I'm over colder weather scents! My Thoughts: I've mentioned before I like melon scents. This is no exception. I find a lot of fruity scents too sweet for me, but melon scents always have that refreshing watery note to them that keeps them in check. This is a very fresh melon scent paired with watery and crisp cucumber. It's the perfect balance of sweet and fresh. This had a strong throw that lasted several hours. Where To Buy: Walmart or ScentSationals website. My Thoughts: I've had hit or miss results with this brand. This one was average throw for me. The scent of this to me smelled like a blend of pineapple, some floral, and watery note. There maybe the slightest bit of coconut in there too. This has a really nice fresh tropical scent. My issue with this is that slight coconut touch. Coconut scents always come off artificial to me and so does this one. It doesn't ruin this scent for me completely, but it's certainly not winning any gold stars. Tropical scents don't all have to have coconut in them! My Thoughts: I like lavender scents and this is on the scale of a sweet lavender rather than a herbal one. I prefer herbal lavenders, but I do enjoy some softer lavender scents. I'm on the fence about Night Shift. It really does smell like a lavender macaroon or some bakery type lavender. I'm not a bakery fan, but I do like the lavender. It's OK, but not one I'd repurchase. This had moderate throw. My Thoughts: I adored this one cold sniff. I feel like mango and peach scents can sometimes get musty or be very artificial. This was a very fresh and bright blend of peach and mango on cold sniff. When I melted this one it was POTENT and it changed from being fresh and bright to nauseating and artificial. I so badly wanted to like this one, but it was just way too strong and way too fake. First impressions can be deceiving! My Thoughts: I wish this one had a scent description because it's so hard to describe. There is a definite salty and watery ocean note in here paired with some type of floral. Ocean scents are my favorite so I like this one. It's very fresh and pleasant. I can't say it's entirely original, but I don't have anything that smells exactly like it either. It doesn't have the "it factor" like TDC Sea Salt & Ocean Breezes, but it's nice and it will remain in my rotation. This had a nice throw for several hours.